A few years ago I found out the hard way that certain varieties of persimmon can leave your mouth temporarily numb if eaten before they’re completely ripe. These are the hachiya and gyombo varieties and I will never make the same mistake again. Although, it might not be a bad idea to eat one before a trip to the dentist. Fuyu persimmons, on the other hand, are as tasty as they are fun to look at – like a mini, shiny pumpkin-fruit. I got a little carried away (as usual) at the farmers’ market a couple weeks ago and suddenly found myself with an excess of rapidly-ripening persimmons, and I thought I’d try them out in a bread. I will say I was a little disappointed that the persimmons’ delicious, natural cinnamon-like flavor was lost a bit in the translation to bread, but not enough to keep me from baking this again in the future. Next time, I’d like to add a little more sugar, and maybe do half persimmon and half pumpkin puree for an even more wintery flavor. It’s a simple recipe and a hearty quick bread, perfect for pairing with a cup of tea by the fire or sharing on a hike, depending on the range of weather-permitting activities in your corner of the globe. Preheat oven to 350 º F. Oil a loaf pan and lightly coat with flour. In a small bowl, mix the persimmon, lemon juice, oil, and sugar-water. In a large bowl, combine the remaining ingredients, except for walnuts. Pour the wet into the dry and mix, just until all flour is moistened. Do not over-mix. Fold in the walnuts. Pour the batter into the prepared loaf pan and bake until a toothpick inserted in the center comes out clean, about 40-50 minutes. Allow to cool for 10 minutes and then remove from the pan. Cool completely before serving. 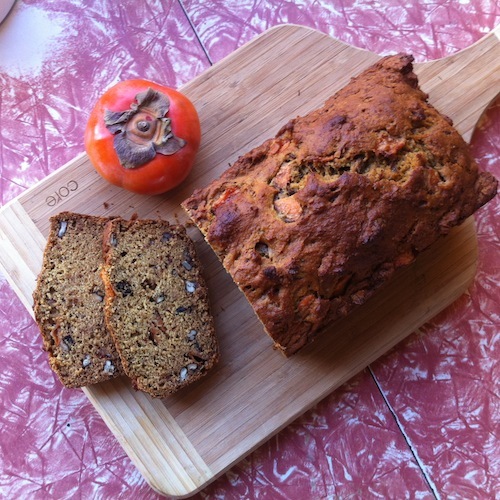 This entry was posted in Not pie, Vegan and tagged Fuyu persimmons, persimmon, persimmon bread, persimmons, vegan. Bookmark the permalink.